What came first: the bipedal human ancestor or the grassland encroaching on the forest? A new analysis of the past 12 million years' of vegetation change in the cradle of humanity is challenging long-held beliefs about the world in which our ancestors took shape – and, by extension, the impact it had on them. 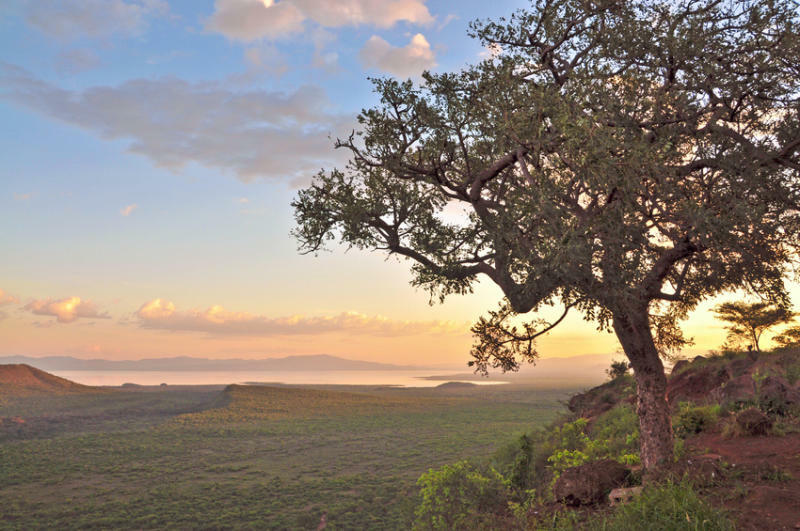 The research combines sediment core studies of the waxy molecules from plant leaves with pollen analysis, yielding data of unprecedented scope and detail on what types of vegetation dominated the landscape surrounding the African Rift Valley (including present-day Kenya, Somalia and Ethiopia), where early hominin fossils trace the history of human evolution. "It is the combination of evidence both molecular and pollen evidence that allows us to say just how long we've seen Serengeti-type open grasslands," said Sarah J. Feakins, assistant professor of Earth sciences at the USC Dornsife College of Letters, Arts and Sciences and lead author of the study, which was published online in Geology on Jan. 17. Feakins worked with USC graduate student Hannah M. Liddy, USC undergraduate student Alexa Sieracki, Naomi E. Levin of Johns Hopkins University, Timothy I. Eglinton of the Eidgenössische Technische Hochschule and Raymonde Bonnefille of the Université d'Aix-Marseille. While the shift to bipedalism appears to have occurred somewhere between 6 and 4 million years ago, Feakins' study finds that thick rainforests had already disappeared by that point—replaced by grasslands and seasonally dry forests some time before 12 million years ago. While earlier studies on vegetation change through this period relied on the analysis of individual sites throughout the Rift Valley—offering narrow snapshots—Feakins took a look at the whole picture by using a sediment core taken in the Gulf of Aden, where winds funnel and deposit sediment from the entire region. She then cross-referenced her findings with Levin who compiled data from ancient soil samples collected throughout eastern Africa. "The combination of marine and terrestrial data enable us to link the environmental record at specific fossil sites to regional ecological and climate change," Levin said. In addition to informing scientists about the environment that our ancestors took shape in, Feakins' study provides insights into the landscape that herbivores (horses, hippos and antelopes) grazed, as well as how plants across the landscape reacted to periods of global and regional environmental change. "The types of grasses appear to be sensitive to global carbon dioxide levels," said Liddy, who is currently working to refine the data pertaining to the Pliocene, to provide an even clearer picture of a period that experienced similar atmospheric carbon dioxide levels to present day. "There might be lessons in here for the future viability of our C4-grain crops," says Feakins.